A 22-year-old has admitted stabbing a sleeping man to death before going on to "molest" a teenage girl in the bedroom of her home just an hour later - but said he had no memory of the two incidents. 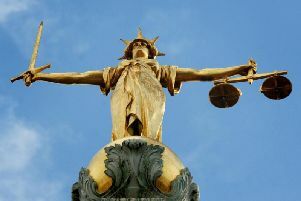 Ben Harvey, of Little London, near Andover, Hampshire, is on trial at Winchester Crown Court accused of the murder of 26-year-old William Rudiak. William Rudiak, of Winchester Road, Chandler's Ford, who died following a single stab after he was found at a house in Turin Court, Andover, on Monday 11 June. He is also accused of assault causing actual bodily harm to the victim's girlfriend Alexandra Taylor by biting her cheek, waking her up. He faces a third charge of trespass with intent to commit a sexual offence. The trial heard that Harvey is accused of entering the home of Ms Taylor in Turin Court, Andover, in the early hours of June 11 last year where he stabbed her boyfriend, Mr Rudiak, while he slept in bed before biting her on the cheek, waking her up. He is accused of then driving to a nearby village and gaining access to a property where he attempted to remove the pyjama shorts of a teenage girl as she slept in bed. When asked by his barrister, Adam Feest QC whether there was any dispute that he had stabbed Mr Rudiak with a kitchen knife from his family home, Harvey said: "I do accept I must be responsible." And when asked if he "molested" the girl, Harvey said: "Yes, I accept that," but when asked if he had any memory of the incidents, he replied: "No, I do not." The trial also heard that Harvey claims to have committed the offences while under the influence of drugs and later told his parents he thought he had been dreaming and had no memory of the incidents. He said he had taken two grams of cannabis the previous evening and drank four cans of beer and also bought and took 0.6g of a "fake" drug he believed to have been cocaine but said it had a different appearance and effect to what he was used to. He said: "I could feel it had an effect but it wasn't the same as the usual euphoria" and added that he could remember taking all of the drugs. Harvey said that he started taking cannabis and cocaine in 2017 and said: "It gave me a great euphoric effect, intense euphoric happiness." He said that his finances were "awful" and that he had debts of £11,000 and had stolen money from his parents on two occasions to buy drugs. He added: "There was only one thing on my mind and that was to get drugs. I was very low and depressed, I was very isolated, I had distanced myself from all my friends, they didn't agree with what I was doing." The defendant said that he went to agricultural college after leaving school before going on to work at a farm before moving on to an auto spares warehouse and then into a job with the Royal Mail. The defendant denies the offences and the trial continues.